As you know from reading our last post, we were quite anxious to get some close-up views of the Serengeti’s world-renowned cat population. With five full days to explore the park, we assured ourselves it would be nearly impossible not to run into at least one or two of the estimated 3000 lions living in the park. That is, unless we hadn’t yet managed to shake off that dreaded curse. Only time would tell. Our very first drive in the Serengeti looked promising. After driving the hour-long stretch of straight, featureless road from the park gate to the Seronera, Mansour made a mad dash to another area of the park. Judging by the sheer amount of safari vehicles lined up, single-file beside the road, we knew we were in store for something good. 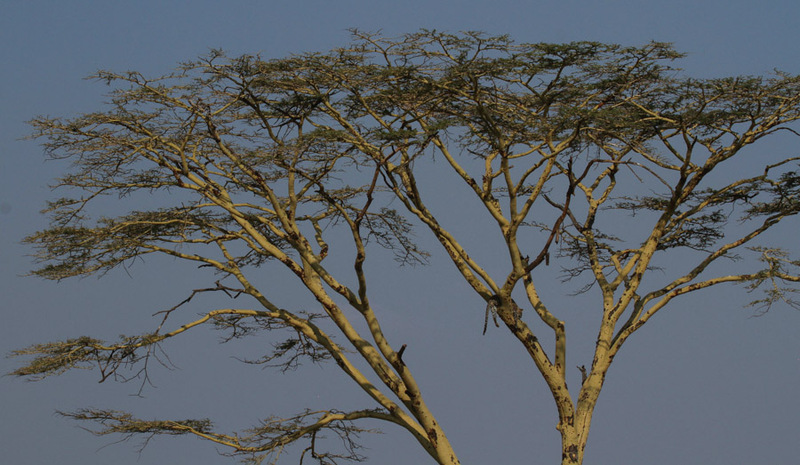 Everyone was staring high into the branches of a magnificent yellow fever tree. We grabbed our binoculars and struggled to see what all the fuss was about. 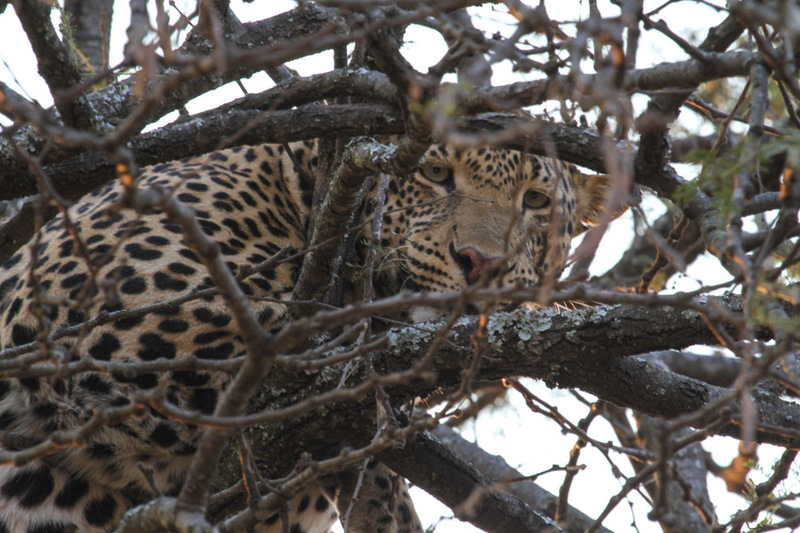 Eventually, we were able to pick out the distinctive spotted tail of a leopard hanging down from one of the branches. Can you spot him? He’s right there… there on the right above the main fork… just to the left… Don’t you see him? Yeah, that’s how we felt. There was actually a second leopard in another tree just next door to this one, and we marveled at both how high the two cats had climbed into their respective trees and how comfortable they appeared to be draped over branches 50 feet above the ground. It was an exciting safari first for us, no doubt, but the beautiful cats were way too far from the road for our 400mm lenses. This was as close as we could get. Right then and there, we took a vow to save up for longer glass before making our next trip to Africa—even if it would mean eating rice and beans for the next several years to make it happen. What a life! Does any animal enjoy sleeping more than a cat? 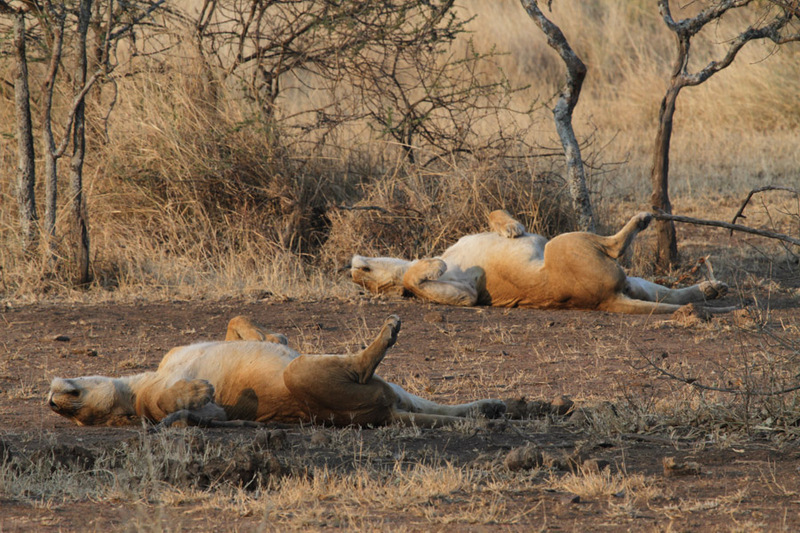 Most cats spend the majority of their time sleeping, and the lions of the Serengeti are no exception. But every time we see lions on safari, we find it uncanny how much these wild felines remind us of their domestic cousins. It’s hard to look at them and not think they’re just big kitty cats. Even Moose agrees. Check out his impression of the sleeping lions. Mansour’s erratic driving had become par for the course on our safari. The guides are constantly stopping to chat and exchange information about what lies on the roads ahead and behind. Every now and then, he would get word of a good sighting, turn around, and start driving like a bat out of hell in a totally new direction. 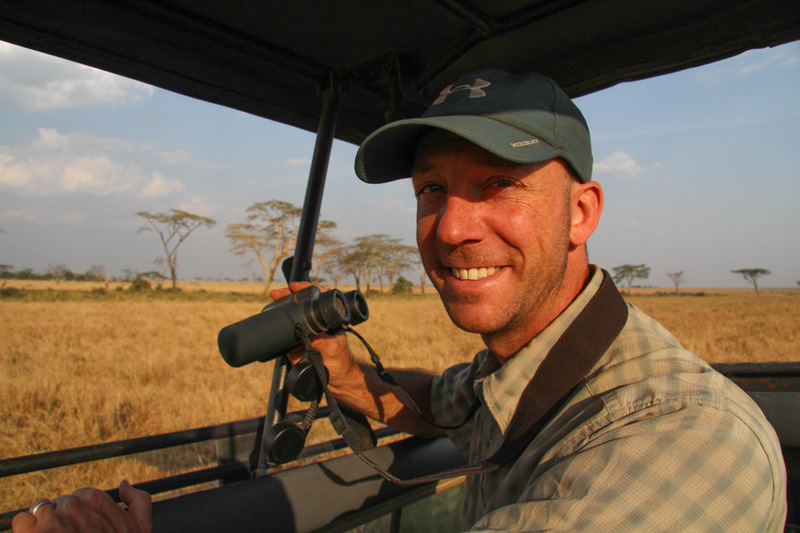 Although the guides know English well, they only speak Swahili to each other when sharing safari intel. Ever anxious, we would keep a close ear on the conversation, trying to pick up hints of what might be in store for us. Like most mzungus, we know many Swahili words for the hot ticket items—simba, chui, duma, tembo—and you can bet that if any of these words from our impressive Lion King lexicon had been uttered they would never have escaped our attention. Which is precisely why you’ll never hear any safari guide worth his salt in Tanzania using them. On the way to Halisi Camp, our first campsite in the Serengeti, we saw two more leopards, making a grand total of four in a single game drive! A good sign, for sure. 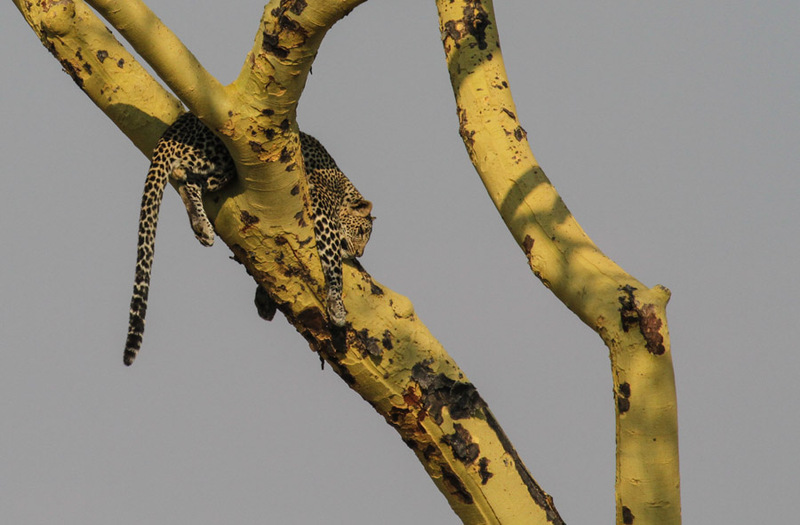 Our third leopard was also lounging in a tree. This one was much closer to the road, but his branch choice left a lot to be desired, photographically-speaking. We spotted our last leopard of the day heading out for a hunt. It was exciting to finally see one on the ground, but he didn’t stick around for any photos. 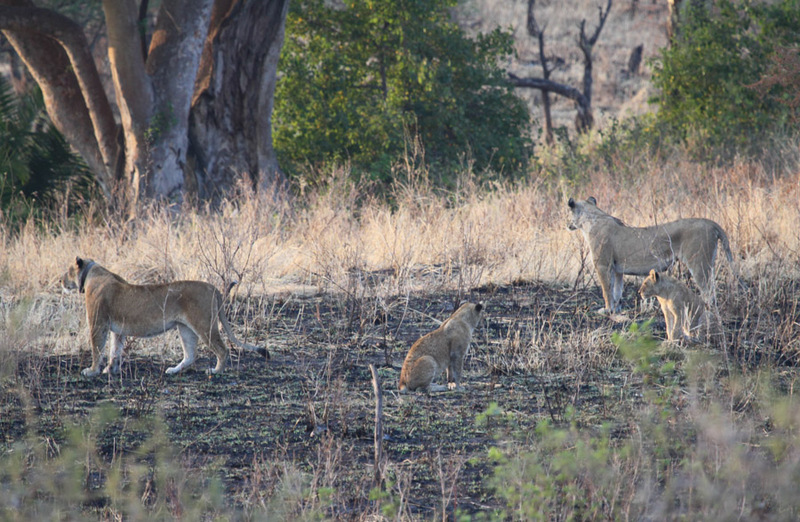 The next morning, we came across a mega-pride of lions on the move. They were across the river from our car, and, at first, we saw just a few. The longer we waited there watching them, the more they kept coming. We tried to count them, but they were spread out, making it hard to keep track. We estimated there were perhaps thirty in all, but the river forced us to keep our distance. And so our days went. 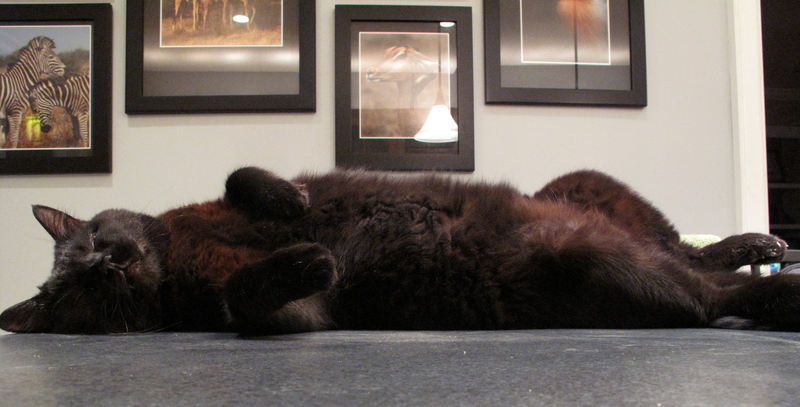 We had many run-ins with cats in our first four days, but the photographic outcome left something to be desired. We saw cheetahs in pairs, a cerval hunting in a field and even more leopards lounging in trees, but geography, distances, harsh sunlight and the ever-important nap times all conspired against any truly impressive photos. The shots below were the best of the lot. Shortly after seeing the leopard above, we saw something we had never seen before. We were just a few minutes down the road when we ran into a jeep stopped beside a pair of giraffe. We love photographing giraffe, but there was something else—a strange movement in the tall grass—that attracted our attention. We yelled for Mansour to stop. He slammed on the brakes, and we stared into the grass. It took a few seconds for our brains to process what we were seeing. A pair of legs was sticking straight up into the air, flailing about. Next, we picked out a pair of tawny ears. Finally, we deciphered the scene. A lone lioness had her giant jaws wrapped around the neck of a warthog. Her poor victim was being suffocated, its body quivering from the agony of death, just a few feet off the road, right in front of our car. With the grizzly scene locked in our camera viewfinders, the warthog’s body went limp. We waited for the lioness’ muscles to relax, for her to release her deadly grip on the warthog and look up at us, the innocent bystanders who had witnessed her gruesome deed. Instead, she held tight to the warthog’s throat. The giraffe looked on in horror. 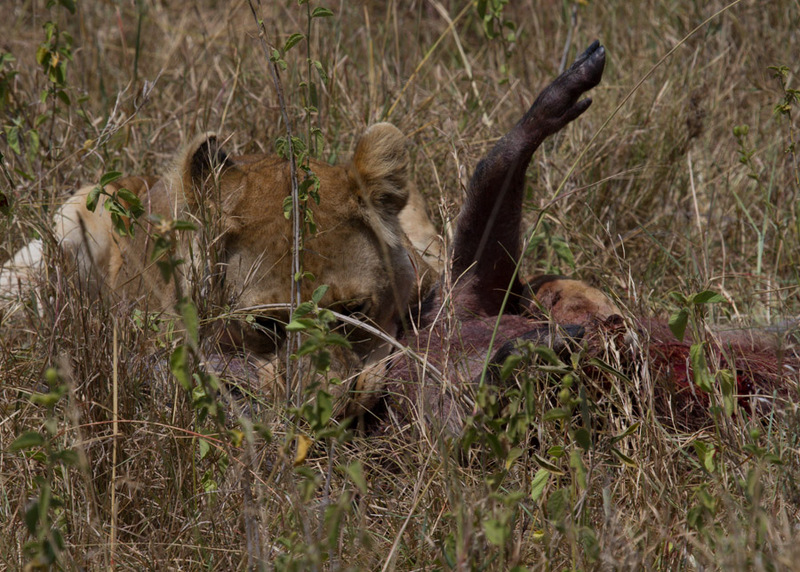 When the lioness finally stood up with her victim still in her grasp, she turned her back to us, stepped over the warthog’s body and proceeded to drag it into the shade of a nearby bush, just out of our view. It was only then that we could see just how big the warthog was. Judging by the size of its huge tusks, it must have weighed at least 250 pounds. The sight of that lioness muscling the warthog back to her lair is something we—and those giraffe—are likely never to forget. It must have made a filling meal. From there, we headed back to camp for our own lunch and some down time to relax before our afternoon game drive. For the next several hours, it was impossible to get that scene out of my mind. It was like a looped movie, playing over and over again in my head. I felt a bit shaky and wondered what the sensation meant. Perhaps the realization of the life and death struggle at play in the Serengeti unnerved me, but perhaps it was something more. What do you suppose it feels like when a curse is being lifted? Excellent photos. What kind of camera and lenses did you use. I’m just starting my photo blog on WordPress. Before I’ve been using RapidWeaver software to make my own site, so I’m still at the beginning of my learning curve with this Browser-based one. I really like the way you linked the photo gallery to the picture on the blog. I’m going to have to learn that trick. It’s much cleaner than linking to a Gallery Page. I was on a 4-day walking safari in Kruger with my daughter when she was getting her MA at the University of Cape Town a couple of years back, but your photos are much better than anything I took. Thanks, Steve. For the most part, we were using a Canon 7D with a 100-400mm lens. The animals are actually way more tolerant of people in cars than people on foot which is probably the main reason you didn’t get the photos you hoped for, but a four-day walking safari with your daughter had to be an incredible experience. WordPress is really great, and the ease of creating galleries is one of my favorite features. Good luck with your new blog. Let us know if there is anything we can help with. Thanks for reading! I appreciate the quick reply. I thought you must be using a large DSLR camera for that quality. I started using a LUMIX GX1 mirror less camera w/20mm pancake lens this year. I need something I can carry in the cargo pocket of my pants. I keep the telephoto lens in my shoulder bag for when I need it. I adjusted my WordPress settings and now use the same style tiled gallery. Thanks for the inspiration I didn’t realize I could do that until I saw your site. Trekking India is great fun, but be aware that the Dalai Lama is giving a Kalachakra initiation in Leh next July and all of the hotels are already booked. The 21-day trek from Zanskar down to Manali is quite scenic. I used a CANON G12 and G9 before moving up to the Lumix GX1 and even a prosumer Point and Shoot isn’t as good as a mirrorless camera. The Lumix brands have the stabilizer in the lens, others, like Olympus, the stabilizer is in the camera. I bought mine just as the model was upgraded so I got it for a little over $300 instead of the $1,000 it cost when it just came out. I highly recommend the mirror less cameras for traveling, but you need to find the one best for you. I started using mine in Peru this past March. My earlier shots were taken with the CANON G12 or the G9. Glad you like the shots, I’ve still got a lot to learn, so I take lots of shots at different settings, then only show the few that came out OK. Thank you so much for all the helpful advice. We will keep it all in mind as we finalize our trekking plans and look into cameras to bring along. It looks like you have already learned the #1 rule of photography: Only show your best shots! Thank you for the feedback, SueBee. We do feel extremely fortunate to spend our summers traveling to such amazing places, and we’ll never tire of trying to get photos of big cats! We’re glad you are enjoying them.